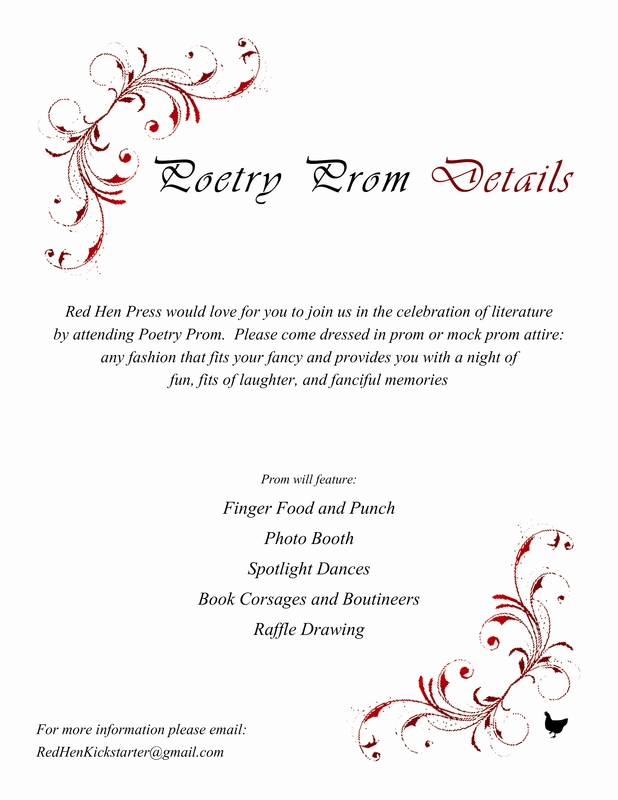 I’m excited to be attending the Red Hen Poetry Prom! I would love to dance to poems with you; what songs would you recommend for our playlist? including a copy of Becoming Judas. 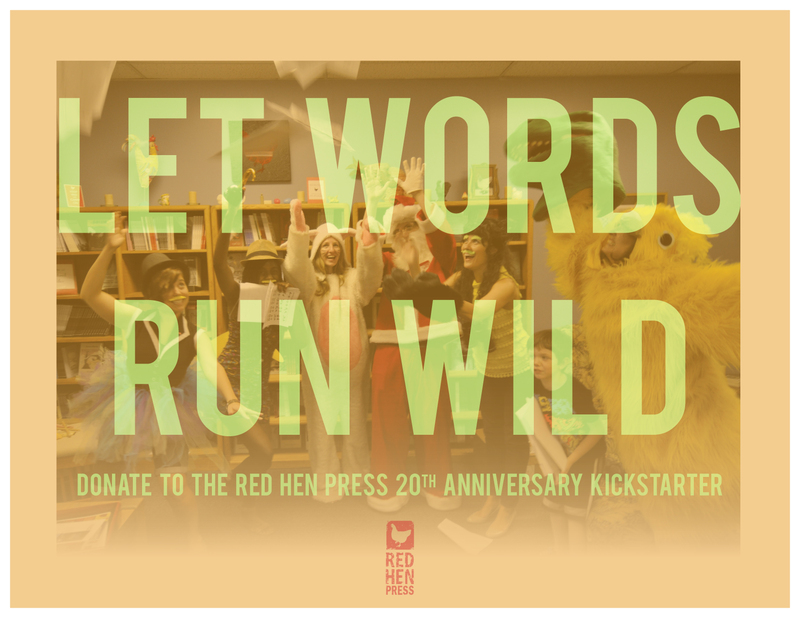 Pasadena, California—Red Hen Press, LA’s largest independent press and one of the largest literary presses on the West Coast, will commemorate its Twentieth Anniversary in 2014. In honor of that milestone, the Press intends to publish an Anniversary Anthology showcasing the depth and diversity of the Red Hen catalog, to produce a free, public festival celebrating literature and the arts, and to conduct a book drive supporting community literacy projects throughout Southern California. To fund this Anthology and the associated programming, the Press is launching its first ever Kickstarter campaign. 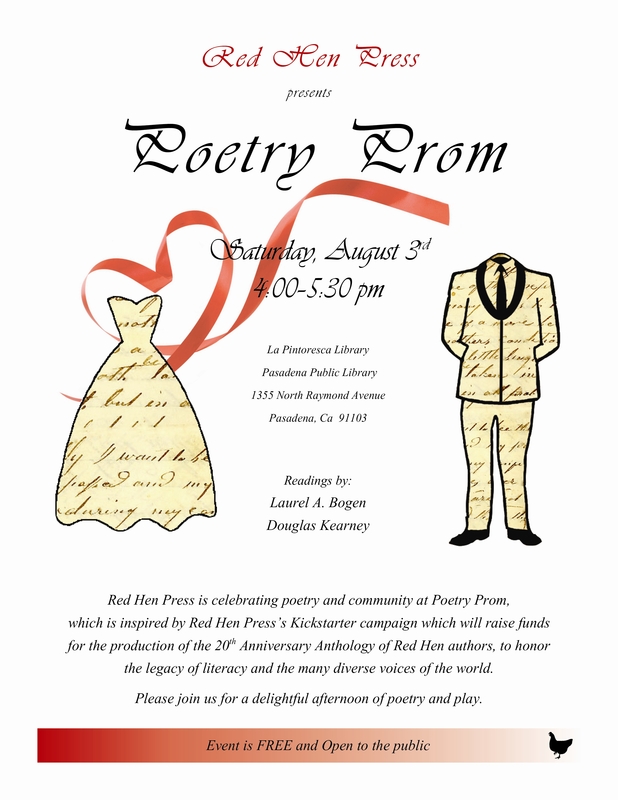 It kicks off at 4 p.m. on Saturday, August 3rd, with Poetry Prom, a free event at the La Pintoresca Branch of the Pasadena Public Library. Please consider picking up a presale copy of Becoming Judas. Keeping copies moving is an important component of maintaining the poetry machine; without your support, my place in the apparatus is unable to function. Presale copies of Becoming Judas are currently available on Amazon.com. Every book purchased makes a huge difference for a writer and their press; by purchasing any book you are contributing to the lives and dreams of many artists. I humbly ask you to consider giving this book a home on your bookshelf. If you would like to know more about Becoming Judas, Brenda Hammack wrote an insightful review of Becoming Judas. I am grateful for her thoughtful words. Becoming Judas the poetry film is online. Please watch this collaborative effort and let me know what you think. I’d love to hear your thoughts on this work. The tricky thing about the”quiet arts” is I never know if anybody is out there, with me, in the dark.